President’s Day is not for another week yet but today is the birthday of Abraham Lincoln – February 12, 1809. Looking forward to seeing who shows up at Fitch tomorrow as the countdown to pitchers and catchers reporting is down to 6 days! 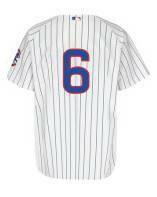 Some Cubs who wore number 6 were, Stan Hack, Johnny Callison, Kieth Moreland, Glenallen Hill, and most recently being worn by Bryan LaHair. A housecleaning note, we will be announcing the full list of nominees for the BOS-BCS Ryno Award as Fan Favorite sometime over the next few days. Once announced, voting will begin for your favorite Cubs blog or website, the fan voting is only for the Ryno Award.